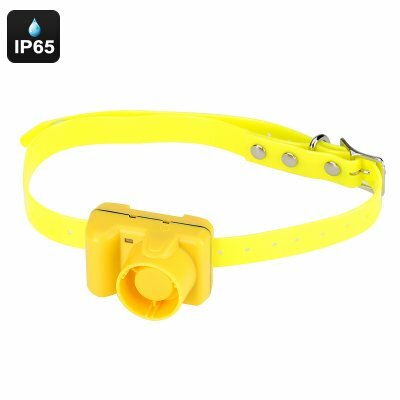 Successfully Added Beeping Dog Collar - IP65 Waterproof, 128dB, 100M Range, Run And Point Mode, Point Only Mode, 500mAh Rechargeable Battery to your Shopping Cart. While many outdoor men love the sound made by a traditional bell while using their trusted canine to hunt for small prey, few can argue that modern beeper collars that feature the latest technology have many advantages over a traditional bell while out hunting. Whereas traditional bells are silent when the dog is not moving, modern beeping collars emit a different tone depending on whether your dog is running or pointing – making it easy to find back your dog while out in the wild regardless whether it is moving or not. Weighing no more than 66 grams and being relatively small in size this beeping collar is the perfect companion for any sportsman that likes to bring along his dog while out hunting. Thanks to its IP65 waterproof rating this dog beeper is capable of functioning perfectly in any weather condition and terrain. Whether you’re out hunting in the snowy mountains or in a humid swamp – nothing will stop this dog beeper collar from operating. Having a sound / noise ratio of 128dB this dog collar emits beeps that can be clearly heard up to a distance of 100 meters. Featuring two different beeping modes and frequencies this collar can be set to run / point mode – making one beep every 10 seconds while the dog is moving and then changing to a beep every two seconds when the dog stops – or point mode only, where the collar makes no sound while the dog is moving, but kicks into point mode and sends out a beep every two seconds once the dog has stopped. Featuring 5 different tones this beeping collar additionally lets you select the tone that suits your hearing most. Featuring a large 500mAh battery this dog beeping collar lasts throughout an entire day of hunting. While back at home or in the cottage your dog’s collar can easily be charged by using the included product charger. Easy to set-up and use, this beeper collar is a separate unit that can be attached to the collar of your dog and detached while not in use. This beeping collar comes with a 12 months warranty, brought to you by the leader in electronic devices as well as wholesale electronic gadgets..